Tirana – Pristina, December 25, 2012 – The IT Media Publishing company, ICTSmedia based in Tirana and Prishtina, brought to the market the special edition of the Computerworld Albania, as an periodical magazine which is aimed to the field of Innovation, Technology and Communication. This number of Jubilee, which came on the 100th anniversary of Independence of Albania, has 100 pages printed material in a modern, colorful and illustrated format. 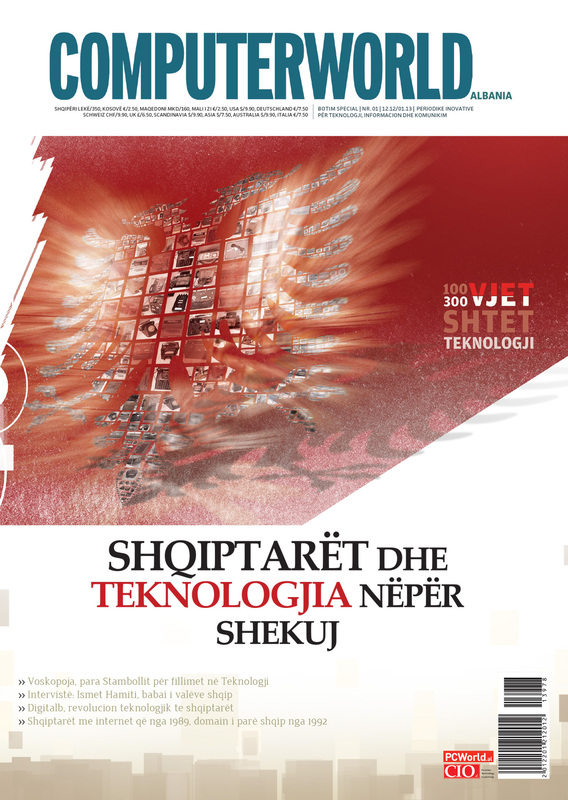 The publication contains various topics, interviews with eminent Albanian personalities from the world of technology, multiple opinions and information about the latest technological trends in the world. The magazine is divided into several chapters, such as: Information Technology, Communication Technology; Bank Technology; Media Technology; Art and Technology; Albanians and the latest world trends. This special number of Computerworld Albania, brings abundant material from the beginnings of the technology among Albanians, dating back three centuries earlier, to the introduction of big Albanian names, which are not only leaving their traces in the international market but are also making a revolution in the field of technology in the world, especially in the field of information and telecommunication. The innovative ‘Computerworld Albania’ periodical, is currently available in most of the points of sales in Albania, Kosovo, Macedonia and it will very soon be in the hands of everyone, everywhere in the pan Albanian space, as well as in Europe, in the U.S. and in the other countries. Computerworld Albania is the first publication of such a nature in the Albanian media, in the field of technology. This is a good start in the world of media technology among us, and is intended to be convincingly the forum in this field for all Albanians, who were far ahead of others in the field of technology three centuries ago.